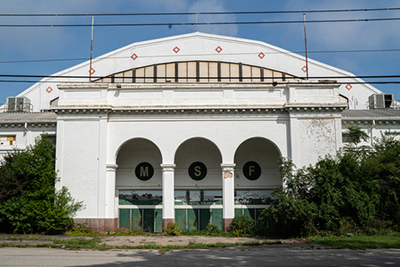 The 158-acre Michigan State Fairgrounds, vacant for close to a decade, will get a new lease on life with the state finalizing sales to a private developer and the city of Detroit. Magic Plus, an investment group that includes former Michigan State University and Los Angeles Lakers basketball star Ervin “Magic” Johnson, closed on its Woodward Avenue-facing 16 acres of the fairgrounds today. The city is expected to close on the remaining 142 acres of State Fairgrounds property later this month. The site is located at the southeast corner of Eight Mile Road and Woodward Avenue. Magic Plus plans to develop its 16 acres for mixed use, says Joel Ferguson, the developer’s owner. The uses include residential, retail, community areas, and entertainment. The city says it will explore different development options to ensure the project creates real economic opportunities for Detroiters as well as ensuring the project benefits the surrounding neighborhoods. The site hosted the Michigan State Fair from 1905 until 2009. The property was transferred to the Michigan Land Bank in 2012 and the Michigan Land Bank board of directors approved the purchase in March 2018. Since that time, the Land Bank has been working with the city and Magic Plus to bring redevelopment to the site.